Are you thinking about installing double entry doors on your home? Even if you have never had this style of entry door before, remodeling is a great time to explore new options. There are a few things to keep in mind when deciding which style is best. Homes with narrow entryways should stick with single front doors. Anything larger can overwhelm the small space. If your home does have a large entryway, you may want to think about expanding to double doors. A single door in a large space can look awkward. It is not too difficult to find double front doors for sale. The hard part is finding the perfect style for your home. Most retailers will have quite a few different design options available. Doors in this style are also made from a variety of materials. Take the time to learn about each style of door. Once you decide which material is best, be sure you pick a door you love. You want to be sure your door will last a long time. Durability is important, but so is style. Visit Southern Front Stained Glass and Doors first. They have a wide selection of rustic and modern double front doors available. You can see their entire catalogue online by visiting http://www.southernfront.com. Consumers can also ask about custom models. Contact Southern Front by calling 281-890-5860 to learn more. Fiberglass double front doors with glass inserts are becoming very popular. These doors are very durable and versatile. You can find fiberglass in almost any pattern or style. There are even fiberglass finishes designed to look like real wood. Fiberglass front doors are also powerful insulators. They are thick and sturdy, preventing the elements from entering the home. Some homeowners prefer fiberglass because of its energy saving abilities. Adding glass inserts to fiberglass front doors can brighten up your entryway. These inserts can be transparent, frosted or decorative. This is a great way to get a door that looks beautiful but is also practical and durable. Fiberglass will last years longer than wood, and requires much less maintenance. Fiberglass does not need cleaning often. This style of door is perfect for homeowners who want something durable yet stunning. Consumers interested in fiberglass double doors should visit Southern Front. They have a large selection of fiberglass doors available in many different styles. You can see their products online at http://www.southernfront.com. If you do not find a style you like, contact Southern Front to ask about custom options. They are happy to help you buy the door of your dreams. Interested customers can call them at 281-890-5860 to learn more. Modern double front doors tend to be a bit more decorative than other traditional styles. Homeowners hoping to add personality and flare to their entryway often opt for a more modern style. These more modern touches might include decorative glass or an intricate pattern. These doors can help update the look of any home’s exterior. When shopping for this style of door, be sure to keep the rest of your home’s decor in mind. You want to be sure you avoid buying a door that contrasts with other exterior fixtures. If you do want to buy a modern door, consider updating those fixtures at the same time. Chances are, if your door needs replacement, those fixtures are not far behind. Southern Front has many modern front doors available. You can take a look at the range of styles and patterns by visiting them at http://www.southernfront.com. Southern Front also offers custom models, so you can be sure you have the modern door your home needs. Prospective customers can contact them by calling 281-890-5860. After you decide on a style, you need to find double front doors for sale. There are many retailers across the country, giving you many options. Avoid shopping at dishonest vendors or buying cheap products. As you are shopping, remember to focus on the company’s reputation, not the bottom line. It is worth paying more for a high-quality product instead of buying one that will not last. It is a good idea to find a company with an established reputation. Look for affiliations with other organizations. Affiliations usually mean there is a history of high quality work. You should also find a company that has a wide variety of doors available. A wider selection gives you more options. Consumers in the U.S. and Canada should visit Southern Front. 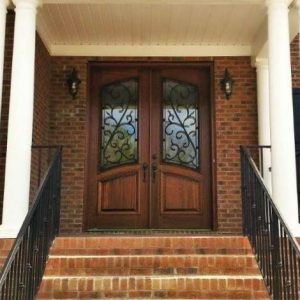 Southern Front has many double front doors for sale in a variety of materials and styles. You can view their available doors by visiting them in store or online at http://www.southernfront.com. If you do not find a door you love, ask them about custom models. Interested customers can contact them by calling 281-890-5860. Southern Front has affiliations with many local home builders’ associations. They hold themselves to a high standard of customer service. When looking for double front doors for sale, there are a few things to keep in mind. You should look for doors that are as attractive as they are durable. While the door itself needs to look great, it should also work well in your entryway. Think about how the doors will look from the inside as well as out. If you find that your entryway might be too dim, consider adding glass inserts or sidelights. You may also want to think about finding a retailer that offers custom models. This way you can be sure you have the perfect door for your home. If you are looking to upgrade your doors, visit Southern Front today. They have many single and double front doors available in a variety of materials and designs. Take a look at their product catalogue by visiting them at http://www.southernfront.com. Southern Front is happy to offer custom models as well as preexisting designs. You can contact them by calling 281-890-5860 to learn more. Southern Front can ship to locations across the U.S. and Canada. Customers in either country looking for double entry doors should visit Southern Front first.